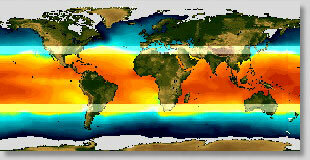 The phenomenon of El Niño was brought to worldwide attention in the 1982/83 year. Before this time it was a well-known phenomenon studied in basic oceanography classes but not a household word. The '82/'83 El Niño was the strongest and longest known in recorded history up to that time and had catastrophic effects around the world. El Niño always centers on the Galapagos Islands (near the equator in the Pacific Ocean about 600 miles west of Ecuador in South America) but generally does not have drastic global consequences. During 1983 I had the opportunity to spend part of the summer in the Galapagos. This was at the conclusion of this most severe El Niño in recorded history up to that date. I was able to document the drastic effects of that El Niño as well as visit the enchanting Galapagos Islands. After returning to Santa Barbara I teamed up with Karl Halbach, Professor of Geology at SBCC, who had also visited the Galapagos several years before. Karl had been there in a 'normal' year. We prepared a presentation of dueling slides and gave a public lecture … Karl showing a slide of the Galapagos in a normal year and then me showing a matching slide from an extreme El Niño year. Karl's images are given photo credit and are reproduced here with his permission; the rest of the images are taken by my husband, Shane, or myself (unless otherwise noted). This presentation is modified from our lecture to give you an understanding of general El Niño phenomena, the Galapagos Islands, effects of severe El Niños, and our current ability to predict El Niños as well as the more recent idea of a counterpart to El Niño - La Niña.